'Bath Salts' Drug Suspected In Miami Face-Eating Attack : The Two-Way The drug has been linked to other crimes in which the suspect becomes irrational and violent. In some ways, they're a "walking dead person," according to the president of the Miami Fraternal Order of Police. Note: As you may have guessed from the headline, there is disturbing content in this post. And scroll down for an update. More is becoming known about one of the most horrific crimes we've heard about recently — the attack in Miami on Saturday during which a man was "biting off parts of another man's face." 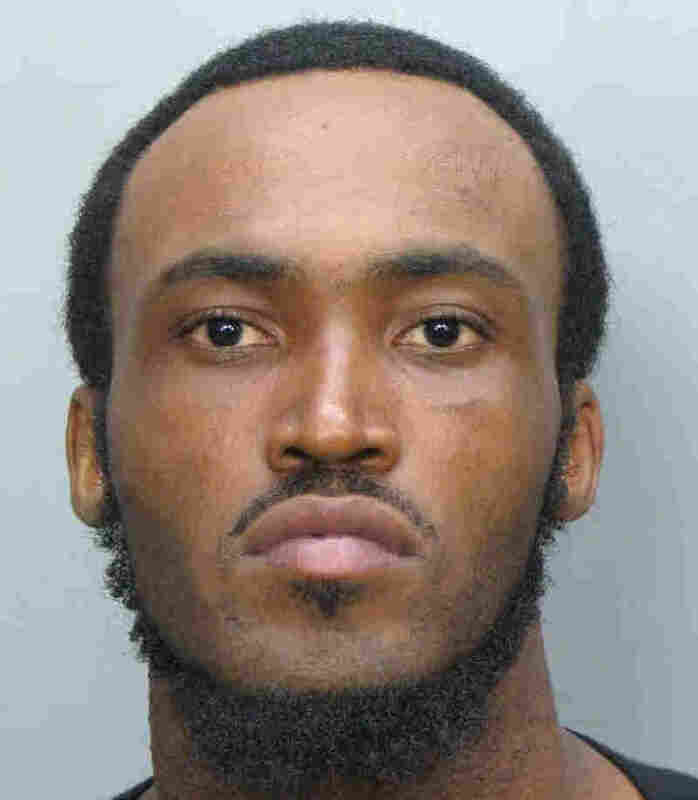 An undated booking mug made available by the Miami-Dade Police Dept., showing Rudy Eugene. He was shot and killed by Miami-Dade Police after he refused to stop eating another man's face. The attacker, Rudy Eugene, was shot dead by police — who pleaded with him to stop but got only growls in response, according to news reports. Eugene's now known as the "Miami Zombie." The victim, Ronald Poppo, is in critical condition and "fighting for his life," the Miami Herald says. He was homeless and living under a causeway. Now, there's a theory emerging that Eugene was high on "bath salts," which as NPR's Greg Allen has reported are a drug "that produces a meth-like high and sometimes violent behavior in users." "The cases are similar minus a man eating another. People taking off their clothes. People suddenly have super human strength," Aguilar said, according to ABC. "They become violent and they are burning up from the inside. Their organs are reaching a level that most would die. By the time police approach them they are a walking dead person." Haven't heard about Bath Salts? "Is a relatively new problem. ... The name covers several synthetic chemicals, including mephedrone and MDPV, short for methylenedioxypyrovalerone, that give a stimulant high similar to meth or cocaine. The stuff is sold under names like Vanilla Sky or Ivory Wave. "The Drug Enforcement Administration invoked emergency powers in October to make the drug illegal." DEA says "people who abuse these substances have reported agitation, insomnia, irritability, dizziness, depression, paranoia, delusions, suicidal thoughts, seizures, and panic attacks. Users have also reported effects including impaired perception of reality, reduced motor control, and decreased ability to think clearly." " 'Felt like I wanted to kill me or kill somebody else. Horrible feeling of sketchiness, constantly looking over your shoulder or peeking out around your curtains or windows, hiding under the blankets.' "
"The man being depicted by the media as a 'face eater' or a 'monster' is not the man she knew, she said. He smoked marijuana often, though had recently said he wanted to quit, but he didn't use stronger recreational drugs and even refused to take over-the-counter medication for simple ailments like headaches, she said. He was sweet and well-mannered, she said. "Eugene's girlfriend has her own theory on what happened that day. She believes Eugene was drugged unknowingly. The only other explanation, she said, was supernatural — that someone put a Vodou curse on him. The girlfriend, who unlike Eugene is not Haitian, said she has never believed in Vodou, until now.
" 'I don't know how else to explain this,' she said." Meanwhile, the victim "will require months of treatment to rebuild his features and be permanently disfigured," The Associated Press reports.